In my family, we do appetizers instead of a big meal for Christmas, and my crispy wonton cheese bites are always a huge hit! Appetizers have always been one of my favorite things to bring to any gathering. You can really get creative and have some fun with it! We love our Christmas appetizer dinner, and I personally look forward to all year! 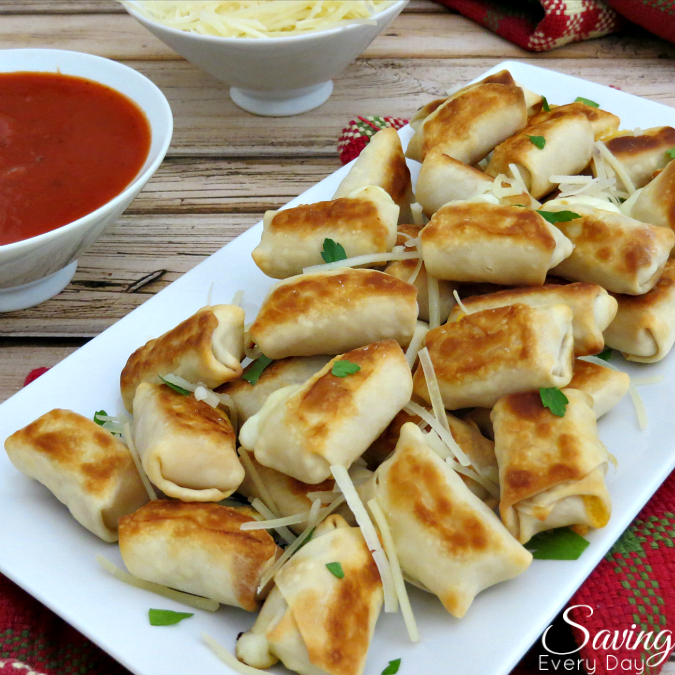 While I love trying out new recipes every year, I have a few that are always requested, and my crispy wonton cheese bites are one of them. They’re so ridiculously easy that I don’t mind cooking up a batch even if I already have my menu planned out. Store-bought cheese sticks make this quick an easy! I don’t know about you, but I despise frying food. It’s just a pain – and messy – so I’m a big fan of oven-frying. The key to keeping these nice and crispy is to use wonton wrappers and spray them liberally with non-stick cooking spray. I use an organic spray, but you can use whatever you want or just brush them with olive oil. If you’re making a dish for a party holiday or special occasion, be sure to garnish! You’ll be surprised how much just a sprinkling of fresh herbs, a few slices of lemon or some chopped nuts can transform a dish into something beautiful. Since this recipe will be served at Christmas, I love the fact that it has red and green in it! Garnish transforms your dish from blah to wow! I set my ingredients up assembly-line style, which makes rolling them quick and easy. Unwrap all of the cheese sticks, cut them into four equals pieces and set aside. 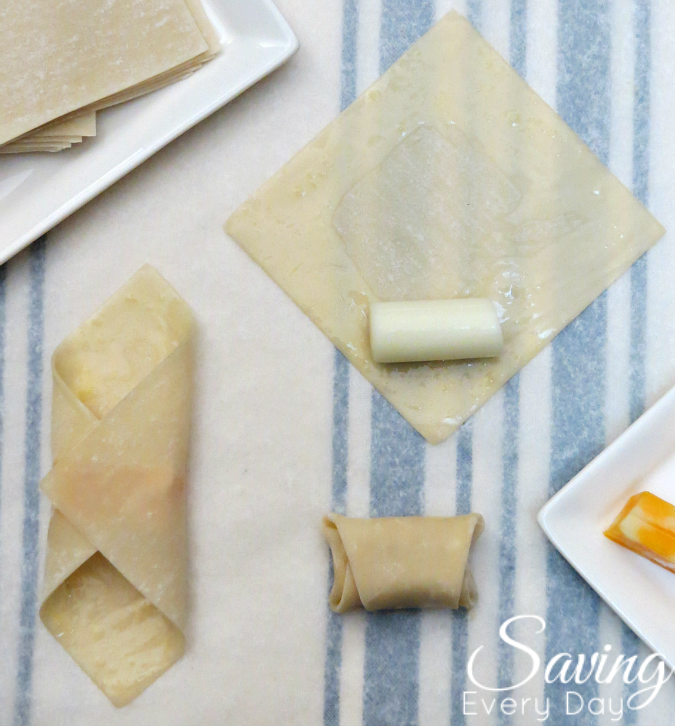 Remove the wonton wrappers from the package, cover them with a damp (not wet) paper towel and set aside. Add an egg white and a teaspoon of water to a small bowl. Lightly beat it and set it aside. Place a piece of cheese in the middle and fold in the sides. Press to seal. 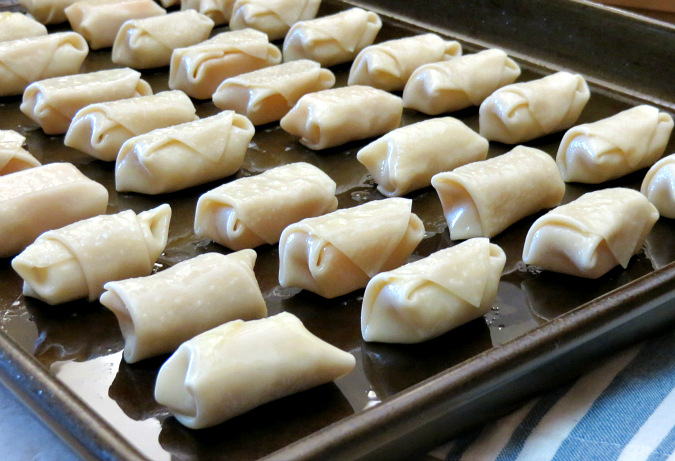 Fold the top over and roll toward the opposite end. Press to seal all edges. Place on the prepared baking sheet and repeat until all the cheese is wrapped. Liberally spray the tops with nonstick cooking spray and bake on the bottom rack for 5 minutes. Remove from the oven, flip and return to the oven on the middle rack for an additional 3-5 minutes or until golden brown and crispy. Cheese sticks baked in wonton wrappers for a delicious, guilt-free snack that's perfect football food or holiday appetizer! 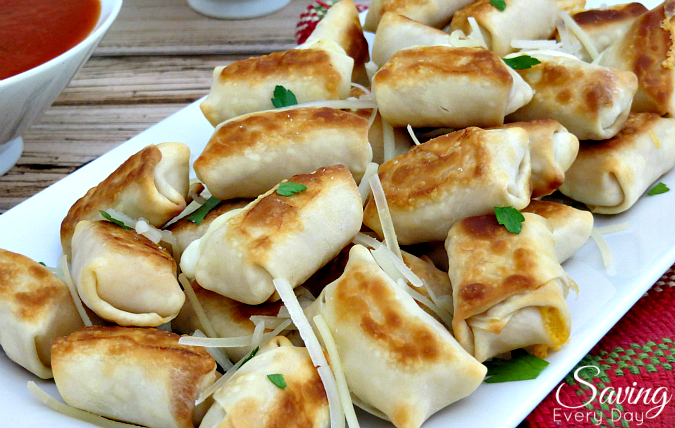 Unwrap all of the cheese sticks and wonton wrappers and set them aside. Remove from the oven, flip and back on the middle rack for an additional 3-5 minutes or until golden brown and crispy. I used mozzarella and Colby/jack for this recipe, but feel free to use any flavor you want. I am going to make these on Saturday for another Mummy and I while we catch up along with some wine! I’m guessing the cheese sticks get cut. I’m not seeing it in the recipe that or I need a nap.